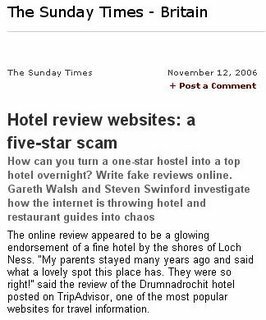 Interesting times following the apparent revelations in the Sunday Times at the weekend about abuse of user review websites, including TripAdvisor. Last night a TripAdvisor spokesman, Ian Rumgay, appeared on the Chris Evans drivetime show on BBC Radio 2 to answer questions. 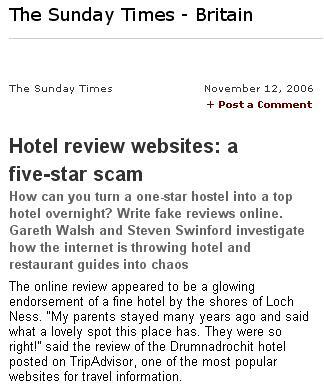 TripAdvisor is somewhat unhappy that it actually sent the Sunday Times investigations' team the name of a hotelier in Scotland who had been caught out - highlighted in the first few paragraphs of the report - in order to demonstrate how the site polices its reviews, though this apparent free flow of information was not mentioned. * It believes TripAdvisor's processes to catch persistent hoax reviews does work - it is the single bogus reviews that are ones more difficult to catch. * The team posted some, what can only be described as wildly inaccurate and often humorous reviews of hotels on Fodors.com, the US reviews site, which is completely unmoderated, to see how long it would take to remove them. Eg. A review of the European hotel was said to have a fantastic view of the pyramids. It took Fodors at least a few days to catch on, in some cases. Also put some further comments on my blog.